The Food Centre is part of thecentre:mk, as well as Iceland there are a number of successful local operators trading. This unit is suitable for a variety of A1 uses. The centre:mk is one of the largest under-cover shopping areas in Europe with over 250 shops, including major nationals such as John Lewis and Marks & Spencer as well as independent specialist shops. With 30 million visitors a year this retail centre is a prime location for any retailer. The Food Centre is part of thecentre:mk, as well as Iceland, MK Post Office and RBS there are a number of successful local operators within the vicinity plus a large open market most days. 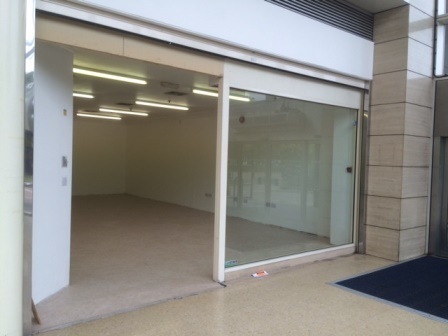 The unit consists of 1,023 sq ft of Ground Floor retail with a WC, storage room and a rear kitchen area. There are approx 800 free for 3 hours car parking spaces nearby. Available on a new lease basis for a length of lease to be agreed. Incentives subject to covenant. There will be a landlord break option the same as every other unit in the Food Centre. All interested parties should contact Milton Keynes Council with regards the exact business rates liability for the property.